31 cm long (12.5 inches). 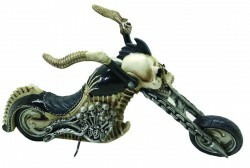 Detailed figurine showing skeleton motorbike. Leans on a small support rod. Cast from solid resin for a stone and bone effect statue. From the popular Nemesis Now range of figurines and collectables.